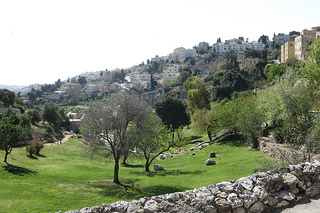 The May-June / Iyar-Sivan Newsletter is Here! 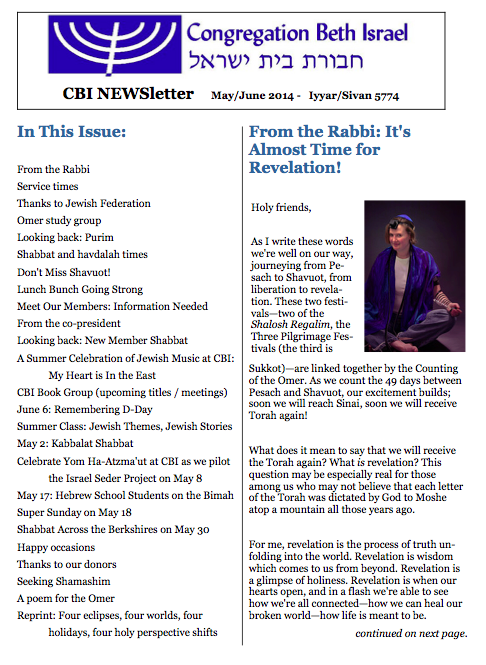 The May-June 2014 / Iyar-Sivan 5774 issue of the CBI Newsletter is here! In this issue: From the Rabbi, Service times, Thanks to Jewish Federation, Omer study group, Looking back: Purim, Shabbat and havdalah times, Don’t Miss Shavuot!, Lunch Bunch Going Strong, Meet Our Members: Information Needed, From the co-president, Looking back: New Member Shabbat, A Summer Celebration of Jewish Music at CBI: My Heart is In the East, CBI Book Group (upcoming titles / meetings), June 6: Remembering D-Day, Summer Class: Jewish Themes, Jewish Stories, May 2: Kabbalat Shabbat, Celebrate Yom Ha-Atzma’ut at CBI as we pilot the Israel Seder Project on May 8, May 17: Hebrew School Students on the Bimah, Super Sunday on May 18, Shabbat Across the Berkshires on May 30, Happy occasions, Thanks to our donors, Seeking Shamashim, A poem for the Omer, and Reprint: Four eclipses, four worlds, four holidays, four holy perspective shifts. If you’re on the CBI mailing list, you will receive the PDF via email today; you can also download it from this post. (Those who don’t have email, and those who have specifically requested paper delivery, will receive the newsletter via US post.) Printed copies are also always available in the foyer at CBI. Enjoy! This year CBI will be one of the pilot locations for an innovative and meaningful new observance of Yom Ha-Atzma’ut (Israeli Independence Day.) On Thursday, May 8 at 6pm (a few days after the holiday itself) we will hold a special seder for this holiday, using a liturgy developed by Rabbi Sami Barth, a senior lecturer in liturgy at the Jewish Theological Seminary. We will read selections from the Prophets; ask a new set of “Four Questions;” explore Hebrew poetry both ancient and modern; ponder ourselves as the “Four Children” who address issues of compromise, safety, and hope; hear excerpts from Israel’s Proclamation of Independence; and discuss our dreams of what Israel might become. Please RSVP to the synagogue office by May 5 so we know how many tables to set up. This program is open to all ages but will be most appropriate for teens and up. Bring a vegetarian / dairy dish to share. 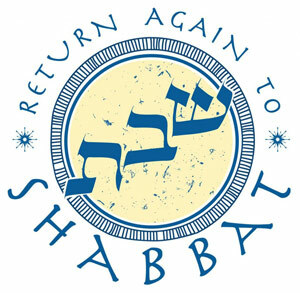 Next Friday, May 2, CBI will hold a vegetarian / dairy Shabbat potluck dinner at 5:30, followed by a Kabbalat Shabbat (“Welcoming the Shabbat Bride”) service at 6:30. All are welcome for one or both. Join us for a festive meal, and for a sweet taste of Shabbat joy & song! That evening we will also have a special guest from Jewish Federation, Albert Stern, who will speak to us for a few moments about Jewish Federation and the work that they do. One of the things Jewish Federation does is support religious education in our community; each student in our religious school received a tuition subsidy of $273 for the 2013-2014 school year, and those subsidies are a vital part of our education budget. Thank you, Jewish Federation! We look forward to hearing from Albert next Shabbat evening. We will also gather the following morning at 9:30 am for our usual Shabbat morning service, followed by kiddush & Torah study. Those of you who were here at our second-night community seder heard me wax rhapsodic about the counting of the Omer. “Omer” means “measures;” originally it referred to measures of grain, and the 49 days between Pesach and Shavuot were a time to count the days until the spring barley harvest when grain would be brought to the Temple in Jerusalem as an offering to God. In the rabbinic undertanding, the Omer period became a way of connecting Pesach to Shavuot on a spiritual level. These 49 days take us from liberation to revelation. At Pesach we celebrate freedom from constriction; at Shavuot we celebrate the revelation of Torah and entering into covenant with God. One popular way of thinking about the Omer period connects each week (and each day within each week) with a different divine quality. This first week is the week of chesed, lovingkindness. What would it feel like to cultivate lovingkindness in our lives this week? Another popular way of thinking about the Omer period connects each day with a different virtue which is associated with the process of “acquiring Torah,” preparing ourselves for revelation and schooling ourselves in practices which allow our best selves to unfold. We’ll explore both of these in our Omer spiritual study group which will begin this afternoon. We’ll also explore some of this material in tomorrow’s Torah study after Shabbat morning services. Because it’s still Pesach, we’ll hear a special Pesach Torah reading, and we’ll sing an abbreviated Hallel tomorrow as well. On Monday — Patriot’s Day — join Rabbi Pam Wax at 9am for a special Passover morning service which will feature Yizkor, the memorial prayers we are blessed to recite four times a year (at Yom Kippur, Shemini Atzeret, Pesach, and Shavuot.) Yizkor is a deep and meaningful practice of remembering our loved ones who have left this world. Please join us. For those who would like to count the Omer each night at home, you can find the blessings here, and here are two places where you can sign up to receive daily Omer messages via e-mail (offering teachings and intentions relating to each day’s practice — and also a good reminder to count, too!) — Making the Omer Count and Daily Omer Teaching. Wishing all of y’all a Shabbat shalom — moadim l’simcha (a joyous festival) — and a meaningful Omer count! I wish you an early Shabbat shalom! 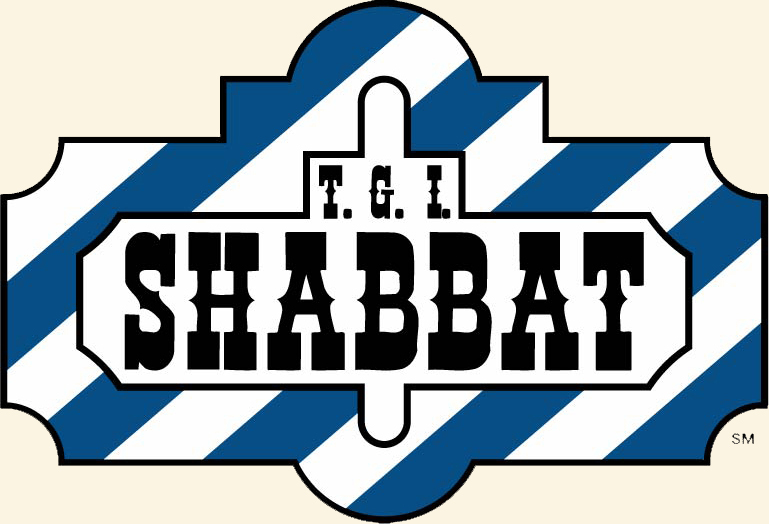 The Shabbat which begins tonight is called Shabbat Ha-Gadol, “The Great Shabbat,” because it’s the Shabbat which comes immediately before Pesach. I hope you’ll join us tomorrow morning for services led by Rabbi Pam Wax. On Sunday morning, the Hand in Hand families will be participating in the ritual of bedikat chametz, ritually removing leaven from the household. Heather and I will “hide” crusts of bread around the synagogue; the kids will find them, and using a feather and wooden spoon will brush them into a paper bag, which we will (safely!) burn in the barbecue grill outside after making a special blessing. This is actually a home-based ritual, not usually done at the synagogue. If you’d like to do this at home on Sunday or early on Monday, here is a short-and-sweet ritual (one poem, plus the blessings) which you can download: Bedikat Chametz [pdf]. Also, if you’re looking for some different ways of thinking about the mitzvot of eating matzah and avoiding chametz, you might enjoy this blog post from last year: Chametz. On the second night of Pesach, we begin Counting the Omer, a journey of counting the 49 days between Pesach and Shavuot, liberation and revelation. In Jewish tradition this is a time for deep soul-searching and meaningful internal work, so that we can be wholly ready to receive Torah at Sinai once again. I’ll be leading a spiritual study group during the Omer, which will meet in my office on Fridays at 3pm during the seven weeks of the Omer — starting next Friday, the Friday during the week of Pesach. All are welcome, though I’d appreciate it if you could let me know if you might join us, so I can print enough copies of the handouts. No books are required for the Omer group, though if you are interested in picking up one or more good Omer resources, I recommend Rabbi Yael Levy’s Journey Through the Wilderness: A Mindfulness Approach to the Ancient Jewish Practice of Counting the Omer and Rabbi Min Kantrowitz’s Counting the Omer: A Kabbalistic Meditation Guide. And if visual art speaks to you more than does text, try D’vorah Horn’s Omer Series of paintings, available on beautiful printed cards for $36. I wish you a sweet Shabbat ha-Gadol and a meaningful journey into Pesach, the season of our liberation! Shavua tov / a good week to you! This week we’re reading parashat Acharei Mot in the book of Leviticus. The name of the Torah portion is a hyperlink; click on it to be taken to the Torah portion in English if you want to read the portion before coming to Shabbat services. This Shabbat, our shaliach tzibbur (prayer leader) will be Rabbi Pam Wax. This is a special Shabbat — the Shabbat right before Pesach — and is called Shabbat HaGadol, “The Great Shabbat.” All are welcome; please join us! We extend a hearty thank you in advance to this week’s service host. If you would like to join the shamashim (“helpers”) who welcome people to our Shabbat services and who host our light kiddush afterwards, contact Pattie Lipman. In this week’s Torah portion we read instructions for what to do if an eruptive plague arises on someone’s house. What does it mean to say that a house is afflicted by a plague, or something like a plague? The description in the Torah text suggests that the plague is akin to mold, described like a disease in the walls. It is as though the house itself were alive and susceptible to infection. We could imagine that this Torah portion speaks merely of this kind of problem: when your house has termites, call the exterminator — when your house has leaks, call the roofer — when your house sprouts mold, call the priest. But I think there’s something deeper here. What did William Shakespeare mean when his character Mercutio cursed, “a plague on both your houses”? For Shakespeare, a house meant a household, a family. If we read the Torah portion through this lens, the stakes are higher. Sometimes, Torah says, a house needs to be scraped clean and then plastered again. And sometimes, even that isn’t enough — it’s a kind of mere whitewashing, and given opportunity, the problem will erupt again. As we prepare to gather with our families and friends around the seder table, what are the places where our “house” needs to be scraped clean and then replastered? What’s the old emotional stuff we want to scrub away? Are we willing to do the work of removing what’s encrusted on the surface of our family relationships, and to expose what lies beneath? In our broader community, what are the places where a plague has grown too deep — where merely cutting out a few problematic pieces won’t stem its spread, and we need to destroy the structure and build anew? Maybe it’s the plague of racism, or the plague of militarism, or the plague of ignoring someone else’s narrative or point of view. Are we willing to tear down what no longer serves us in order to build something different, something as-yet unknown? At this season many of us are engaging in literal housecleaning. Maybe it’s that impulse toward spring cleaning which arises when the temperatures start to hover well above freezing. Maybe it’s the old pre-Pesach tradition of scouring every surface and getting ready to relinquish our hametz, our leaven, which the Hasidic tradition says can represent the puffery of ego. As you clean for Pesach, consider this other kind of housecleaning, too. What behaviors or habits or patterns do you want to place in quarantine? What emotional dynamics in your household do you want to scrub away in order to meet the season of our liberation fresh and new?